Last fall TransitCenter, a New York-based foundation dedicated to improving urban mobility, awarded the Active Transportation Alliance one of 16 grants distributed nationwide to promote better bus and rail service. Active Trans has been using their $150,000 in funding for a project called Speeding Up Chicago’s Buses, which involves working with the CTA and the Chicago Department of Transportation to eliminate some of the roadblocks to faster service and higher ridership. Active Trans has hit the ground running by getting input from almost 2,000 local straphangers about the improvements they want to see made to local bus service, and the group will be using this feedback to push for positive change. In March they launched an online survey, available in English and Spanish, asking CTA customers about their experience riding these lines. The survey will continue until the end of April. 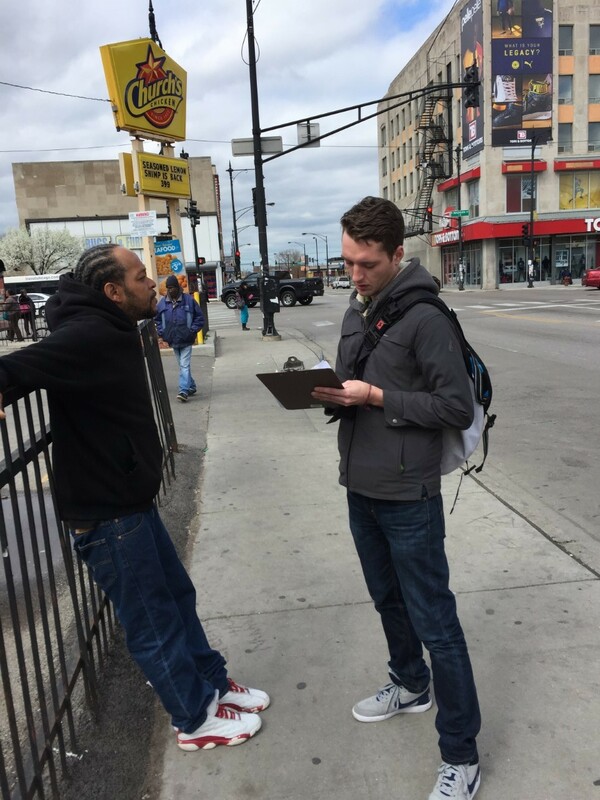 Whitehead and Active Trans interns have also been doing in-person canvassing at popular bus stops along these routes, often key transfer spots like ‘L’ stations. They’ve also focused on locations where there are bottleneck issues, such as stops with boarding delays that could be addressed by having customers pay their fare before boarding the bus. (The CTA has already been testing prepaid boarding at bus stops by the Belmont Blue Line station and at the Madison Avenue and Dearborn Street stop along the Loop Link route.) Recently they’ve buttonholed riders at the 79th Red Line station and the Irving Park Blue Line stop, plus the North/Pulaski bus stop and several Pulaski stops further south. The online and in-person questionnaire asks which of the six featured bus routes the respondent rides most frequently, how often they ride, how they would rate their ridership experience, and what kind of commutes they make by bus, such as trips to work, school, shopping, medical appointments, entertainment, and social visits. Then CTA customers are asked to rate the importance of various aspects of the ridership experience, from “not important at all” to “extremely important.” These include how long the wait is for a bus; how fast the trip is; whether the stop has a bench, shelter, or electronic display with bus arrival info; how long the trip actually takes compared to how long they expect it to take; how easy, safe, and pleasant it is to walk to and from the bus stop; and whether or not they could sit comfortably aboard the bus. In addition, Active Trans has identified at least one community organization along each route that is interested in collecting input on ways the routs could be improved. Using this input, along with input from other advocates and experts from inside and outside Chicago, plus data analysis and input from the CTA and CDOT, Active Trans will prepare a report with analysis and recommendations for improving service. “These will be our advocacy recommendations moving forward,” Whitehead said. In addition to prepaid potential improvements to these routes include all-door boarding and level boarding (which is more-or-less provided by the raised Loop Link stations), transit signal prioritization (which is currently being implemented on Western and Ashland), and bus-only lanes. “The dedicated lanes wouldn’t necessarily be for the entire route, but they’d be especially useful in slow zones, where delays can have a ripple effect in terms of bus bunching and reliability along the whole route,” Whitehead said. Once Active Trans has narrowed down the types of improvements that are most important to CTA customers, their goal will be to be to build political will for these changes by educating the public and the media about the potential benefits, and lobbying lawmakers to throw their support behind these initiatives. These relatively inexpensive, commonsense solutions could go a long way towards improving Chicago’s transportation network, so hopefully local leaders will get on board with the plan. CTA needs to educate drivers on ways to react to bunching that aren’t just “let’s all stupidly sit in line and stay bunched”. While there are no magic bullets, it’s so rare that I actually see buses leapfrogging or doing anything else that would help. Another no brainer would be to have more buses go express when bunches exist at a major transfer point like an L station. ie, the first bus skips all stops for at least a mile, taking those going longer distances and the second one does local, or when there are 3-4-5 bus bunches, break it up so the buses get spread back out. Pete and Repete were riding a bus. Pete got off and who was left? I’m sorry but there must some other reason the CTA is doig this rather than for the answers. At least some jobs are being created even if make work jobs. As I read the article I saw that the CTA already, as I assumed, had all the right answers. Priority signals, prepay boarding, bottle neck bus lanes and even heaven forbid BRT. What do people want? They know that too. Frequent and fast and close enough service. One idea I don’t mentioned is to consolidate stops, as there really doesn’t need to be a stop every block in most cases. For instance, on the #74 there’s a stop at Spaulding that is 360′ or a 1 minute walk (according to Google Maps) from Kimball. Stopping there could be the difference between a westbound bus catching the light or not at Kimball. On the #73 I used to watch the bus take about 5 minutes to go from Campbell to Western when the bus was in plain site with minimal traffic in front of it. Stopping at Campbell gave enough time for cars to pass and build up at Milwaukee that it could take an extra cycle (sometimes multiple) for the bus just to get to Milwaukee. Then, enough people get on at Milwaukee that it catches the light again, only to go 310′ to Western and stop again for a light cycle or two. I’d say that strategically consolidating/eliminating superfluous stops would go a long way to making buses quite a bit more reliable. It’s not traffic that kills their pace, but the frequency that they stop in said traffic allowing cars to continually pass them. I think the biggest issue with that would be how to handle passengers already on the express bus who would need to depart and get on a different bus. This works on trains because the passengers are in the station when they get off, and don’t need to pay again. On buses, it’s a whole different story. Obviously, if people use their Ventra cards it wouldn’t be all that difficult to sort out, but there are still so many people that pay with cash that would make it a bit more difficult to handle. I’d rather see one of the two buses (hopefully the emptier one) wait at a major stop for a few minutes to gather more riders while the front bus breaks away from it a little and gives them a better spacing. Great insight. Usually the idea is framed as eliminate every other stop rather than search for strategic stops to eliminate as you suggest. I suppose if they interview you they will get it. But really I have to imagine they have several bus drivers who could or have told them something similar. In any case a prime example of where a strategic bus lane and/or signal priority would help as well. Ironically enough, decades before GPS this is exactly what the buses used to do. I still quite vividly recall being shooed off of an #8 Halsted just south of Division, circa maybe 1986. That was quite startling, but it made perfect sense. CTA bus drivers need to take some responsibility for the behavior of the passengers. Specifically the ones who are catcalling the female riders, I can’t tell you how many women I know have told me they won’t take the CTA due to the piggish behavior of men, and the CTA is ultimately responsible. The sign “if you see something, say something” sends a mixed message when the driver is RIGHT THERE and doing nothing regarding what is happening on *their* bus. In the old days, the drivers stopped the bus, gave the stink eye and threatened to remove people from the bus who did that, and then followed through if the behavior did not stop. How are they going to factor in how the City as a whole has dropped in population? Given that areas in close proximity to the L on the North Side have seen a lot of development, I imagine the decline in populations further out from the CBD hub may be even more pronounced. Chicago peaked at 3.6 million people… there’s a lot of room to grow, but absent the industries that used to be walking distance from neighborhoods, we really do need a circle line to make moving around on the City’s periphery more efficient for CTA users. I suppose you mean because one street has the stop on the far side while the next has it on the near side. That made me think of the situation at 6-way corners. There I sometimes wish it stopped both on the far and the near sides. Especially if I’m trying to make a connection with another bus. There are arguments for having stops on the front end of an intersection (easier for people) as opposed to across the street (better for traffic flow as the bus doesn’t gum up the turn lane). But having stops on each side of an intersection would really slow down the buses. My anecdotal sense of how the two stops on a block situation has happened is politically connected developers have been able to get stops in front of their properties. Is this serious? Although we are in the 21st century, apparently the CTA lacks the IT prowess to competently schedule buses. Whether rush hour or not, the #146 tends to run as a conga line of multiple buses; than a lag of up to 25 minutes. When supervisors were utilized at locations en route, such bus congestion was prevented. Instead of eliminating the route supervisors, the CTA kept the ticket booth agents on the ‘L’ and subway, despite their positions eliminated in early 2000s from making change, as so much change fell through the cracks. So today, we have ticket agents at every station, some stations having 2 or more (Clark/Lake, just doing nothing but jaw-boning to the people emptying the trash, or working their cell phones. At least when the conductors were eliminated, many were re-trianed to be motormen. What happened here? 1) When politely asking somebody to lower the volume of their music or phone call, typically they shoot back with, “this is a public area, and I can do what I want!” At a minimum, signage inside the trains/buses should clearly point out that contradiction, including the statutes and laws to be charged for disturbing the peace. 2) Panhandlers going from car-to-car on subway/’L’ requesting money. 3) How often are the elevators power hosed to eliminate the extreme urine smell? 4) Mothers getting on buses with golf carts in lieu of baby carriages. What happened to the restrictions re size and rush hour? 5) Stop training new drivers when people are trying to get to work in the morning; pathetic to watch them unadvised by the supervisor to pass another bus on Marine Drive. 6) Lack of a singular, correct arrival indication of buses, between shelter signage, apps, and building lobby apps. 7) Other than City Hall cheering about its “Loop Link” concept, why do the buses southbound on State not stop at Madison where the Loop Link is located; nor at Adams to catch the other westbound buses? Just prevent right turns on those streets that would otherwise delay the bus routes. 8) Build a streetcar line from the commuter depots (Union/Ogilvie) to Willis, LaSalle financial districts, City Hall, Michigan Avenue, Northwestern, Navy Pier (how many hotels would be served?). Ugh, I wish CTA would do that at times to relieve bus bunching! Run one express, with the driver announcing ‘this bus will run express to ____’ stop. Plus that maybe those who paid with cash, could be given a paper slip that they rode that bus that went express and skipped past their usual stop. If that worked for the CTA in the 1980s, I don’t know why they can’t still do that today. It’s little things like bus bunching(hello #22 Clark bus), that often make me turn to biking to places instead. I know for some routes(#50 Damen), I ride those more often since they have a greater tendency of sticking to the schedule. Never mind #50 has periods like nighttime, where the buses only run every 20-25 minutes. But thankfully do more often stick to the posted schedule. And for the LOVE of god, the CTA should discipline drivers who don’t log into the CTA Bus Tracker system when doing a run on that bus route. After bus bunching, that’s my other very huge annoyance, the ‘phantom bus’ issue. Not seeing an upcoming bus for a while on the tracker, but not long after I wait at a bus stop or walk along a street(if I get very impatient and I don’t have my bike), one shows up. I’m torn about that. On one hand I don’t want too many stops near each other along a bus route, but on the other hand I have appreciated drivers that did let me off before the actual stop even if there isn’t a bus stop there. For example, being let off the southbound #50 Damen bus on the north side of the Irving Park/Lincoln intersection(by Starbucks), so that I only have to cross one street(Damen) to get to the westbound #80 Irving Park bus to make a transfer. It’s a PITA to try to cross all those streets to make the transfer to the westbound #80 bus, if the bus driver forces me to get off at the regular southbound #50 stop past the Irving Park/Damen intersection by a bank branch. Sometimes I’ve gotten lucky if westbound Irving traffic was significant on Irving Park and ran on the sidewalk till I made the bus one or 2 blocks west, a few infrequent times. Usually there isn’t enough traffic to slow down buses that much, so honestly I cross my fingers that the driver will be nice and let me off by the Starbucks, so that I don’t have to cross more than one street to make my southbound #50 to westbound #80 transfer. Back to that first note, I don’t mind if stops too close to each other are eliminated. Some years back, the #80 Irving Park bus route had stops at California(2800 west), Mozart(2830 W), and Francisco(2900 W) for whatever bizarre reason. I don’t think it’s a big deal that Mozart was eliminated as a stop, and that now people who used to use Mozart have to walk to California or Francisco. As far as I know, I struggle to think of any other cases where bus stops were that close to each other, on the #80 route. And that eliminating Mozart was a fair move to do. Also, I wish CTA would bring back more of the X__ express bus routes. It was a nice small step they brought back the X9 and X49, but I sometimes wish they’d resurrect the X80 bus. Heh, I won’t deny that sometimes I wish the #11 Lincoln bus had more of a fair pilot run(with longer weekday hours), and that the pilot test had been successful to restore Lincoln service south of the Brown Line. I wish 31st Street riders luck, that the CTA does keep bus service running on that street, at the end of that pilot bus service test. Re 31st and Lincoln see Jarrett Walker on Ridership vs Coverage routes. The CTA is being disengenous by not framing and then judging the two routes in those terms. Almost bait and switch. 3. Better policies in operations to let drivers skip multiple stops or short turning to get up to a balanced schedule/headway. Fewer people riding the bus will lead to more driving and declining transit service, so it's important to reverse the trend. It's common to see non-CTA drivers, especially operators of private commuter shuttles, illegally using the lanes. Here’s a cheap, fast, effective solution to this problem. After announcing that the pilot would end this week, the CTA is giving the route a reprieve.